2016 Edit - Poutine has since rolled out Canada-wide. I'm not sure if I mentioned this on the blog before, but I lived in Ottawa for 4 years while I studied for my Undergrad degree. Ottawa is just across the river from Quebec, but to be honest, we never really went all that often. I am a little disappointed, as sometimes Quebec had different McDonald's items that the rest of Canada had, the Poutine, is definitely one of those items. 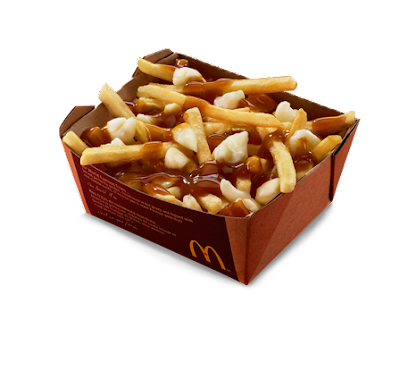 For those of you who don't know what a Poutine is, it is easily one of the most unhealthy food items on the planet...and probably one of the tastiest as well. French fries, covered in a thick brown gravy, and served with fresh "squeeky" cheesecurds. (Read the Wikipedia article for more information). I was able to have the McDonald's Poutine only one time, at the Montreal Train station when my friend and I visited Montreal for a weekend. It was a bit too long ago for me to remember the exact taste, so I won't give it a rating out of 5. But look at the photo, it makes me hungry just looking at it. Also, the two muffins are from the $1.39 muffin + coffee combo. No point of buying a small coffee when you can get an muffin for an extra few cents! McDonald's Canada Poutine Nutrition and Ingredients list.